The Technical Consumer Goods (TCG) market has experienced a stable start to 2012. The total sales volume in the first quarter of 2012 was just under EUR 12.6 billion, representing a positive growth rate of 0.6%. This is the result of GfK TEMAX® Germany for the first quarter of 2012. The markets for Consumer Electronics (CE), Major Domestic Appliances (MDA) and Telecommunications (Telco) in particular, were in the black in the first quarter of 2012. This has led to a generally positive start to the year. The total sales volume of all the observed markets of the GfK TEMAX® was just under EUR 12.6 billion. This represents an increase of 0.6%, compared with the first three months of the year before. While the Telco sector stood out with a double-digit sales growth, the Photo sector started the year more tentatively. However, the photokina event raises hope for a positive turnaround. The Telco sector experienced a healthy start to the year, achieving a sales volume growth of 12.9% in the first quarter of 2012. On the basis of subsidized prices, a total of EUR 1 billion was recorded from January to March 2012. Thus, Telco remains the fastest growing sector in GfK TEMAX® Germany. Smart-/mobile phones in particular remain in demand; their revenue continues to show double digit growth. Phone systems also saw increased demand in the first quarter of 2012; sales volume grew by 2.9% to EUR 65 million. Landline telephones and fax machines, however, suffered a loss in terms of growth and turnover in comparison to the same period last year. Thanks largely to the continued high demand for smartphones, further positive growth rates for Telco products are to be expected in the course of the year according to GfK. Compared to the corresponding period of last year, the MDA sector in Germany recorded a growth of 7.9% in value terms in the first quarter of 2012 and achieved a sales volume of EUR 2.1 billion. Almost all the observed product segments contributed to this positive development in the first three months. Washing machines and dryers benefitted from revenue-enhancing developments like larger drum volumes and higher energy efficiency and increased their sales value compared to the same period last year. For dishwashers, the trend towards energy efficient and economical devices with water consumption up to ten liters per flush continued. Also, thanks to these higher-quality products, the sales growth of 5.5% is a very positive sign. Cooling recorded an even more significant increase of 13.2%. Thanks to the continuing trend towards larger capacities and combined fridges and freezers, as well as the growing importance of high-quality equipment and surfaces, a sales volume of EUR 379 million was achieved in this product segment from January to March 2012. The CE sector is developing well and can look back on a successful start to the year. For the first quarter of 2012 there was a moderate increase of 0.6%, which corresponds to a sales volume of EUR 2.7 billion. This growth was mainly down to the performances of flat-screen TVs and set-top boxes. Both segments benefitted from the digital upgrade of individual households, caused by the shutdown of analog TV broadcasting on April 30th 2012. The end of the analog era has created more space for TV-programs in high definition quality. Thus, from May 2012 further HD channels will be available via satellite and in the paid HD +, option additional channels in HD quality will follow. These factors stimulated the television market in the first quarter of 2012. The continuing trend toward large products with high quality equipment also caused a positive trend in this segment. The revenue driver in the home audio area was docking stations, which are more and more integrated into the equipment. Whether for smartphones or portable media player, the consumer now gets the chance to enjoy their music, stored on their mobile, in their home. As the European Football Championship in Poland and Ukraine as well as the Olympic Games will take place this year, a positive boost in sales in the CE sector for the next quarter can be expected according to GfK. The SDA sector reached a sales volume of EUR 719 million in the first quarter of 2012, which is 0.5% less than in the same period of 2011. The decrease in hair care, shavers and vacuum cleaners was noticeable here. The strongest revenue drivers were traditional kitchen appliances, dental care, kettles and above all deep fryers, which saw a double-digit growth in value terms. The business of coffee and espresso machines was largely stable. Here, too, differences between the various sub-markets can be observed: the sales volume of fully automatic machines increased, pad and capsule machines were at approximately the same level as in the year before, while traditional filter coffee machines declined. In the household area irons and especially high-quality steam generators provided positive impulses. The Office Equipment sector achieved a sales volume of EUR 1.2 billion in the first quarter of 2012. Compared with the same period last year, this is equivalent to a decline of 2%. Especially printers showed a weaker development, slipping significantly into the red from January to March 2012. Only the laser printer market demonstrated slightly positive growth rates. Above all, the business of copiers developed well in the first quarter of 2012, with a value-based increase of 7% and therefore continued its positive growth. Also, data and video projectors experienced a rising trend. Driven by the forthcoming European Football Championships in Poland and Ukraine, strong impulses are to be expected for the core segment of lamps and LED mini devices according to GfK. The growth rates in the IT sector in the first quarter of 2012 were in the red with 2.9%. Between January and March, the sales volume reached EUR 4.3 billion. This is mainly due to the modest growth in mobile PCs. The most important segment in terms of value could not live up to the sales level of the previous year, neither in the business with private consumers nor in the B2B sector. On the other hand, server and workstations succeeded in the B2B sector with a growth rate of 27.2%. The biggest increase in the sector, however, was made by the youngest segment, webbooks/tablets (74.3%). This reflects the increasing trend towards mobility in the computer market, for which these devices are perfectly made. Despite the less than optimal start of the year, the demand for IT products in some areas remained high. This provides an optimistic mood of the second quarter of 2012. The Photo sector experienced a difficult start to the year. Compared with the corresponding period last year, the sales volume declined from January to March by 10.1% to EUR 536 million. Decisive for the slow development of the sector, was the decline in value terms of the most important segment, the digital cameras. The trend is clear with regards to digital single lens reflex cameras and compact system cameras, while the area of fixed lens cameras also declined. However, the very high market saturation in this segment is also a factor when looking at this decline. In total, entry-level and promotional products recorded a stronger decline than well-equipped, high-quality offers. Cameras with fewer features and simpler equipment engaged more and more in competition with smartphones. In order to generate new sales incentives and to give the photo market a positive trend, trading-up of digital cameras is the logical and necessary consequence. The first quarter of 2012 saw a stable sales growth of 0.6% for the TCG market. Thanks to the stable economic situation and the very good situation of the labor market, Germans are still assuming rising salaries. This creates conditions that, despite all the economic uncertainties in the European context, give reason for optimism for the coming quarter. Moreover, according to GfK, positive impulses can be expected due to the upcoming European Football Championship in Poland and Ukraine. Especially the TV segment and video projectors are expected to benefit from this event. For the declining Photo sector, this year's event photokina is expected to provide a major boost for innovation and sales. 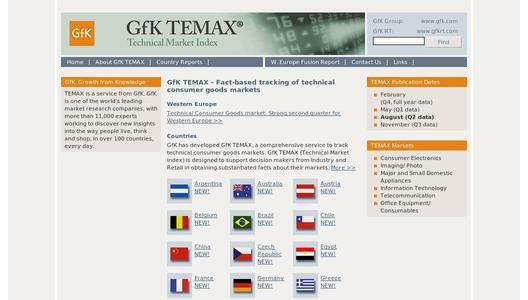 GfK TEMAX® is an index developed by GfK to track the technical consumer goods markets. The findings are based on surveys carried out on a regular basis by the retail panel of GfK. The retail panel comprises data from over 370,000 retail outlets worldwide. Since February 2009, GfK has also been compiling the GfK TEMAX® index at international level in more than 30 countries. It is the first index that includes all of the markets for technical consumer goods in different countries. All reports and press releases are available at www.gfktemax.com. If information from this press release or www.gfktemax.com is cited, GfK TEMAX® should be explicitly indicated as the source. GfK is one of the world's largest research companies, with more than 11,000 experts working to discover new insights into the way people live, think and shop, in over 100 markets, every day. GfK is constantly innovating and using the latest technologies and the smartest methodologies to give its clients the clearest understanding of the most important people in the world: their customers. In 2011, GfK's sales volume amounted to 1.37 billion euros.